The Arctic Accelero Hybrid comes into an already chock-full market of GPU coolers. The most common form of “aftermarket” GPU cooler isn’t really aftermarket at all, but the non-reference design cooler that a manufacturer mounts on their graphics card. Beyond that, air coolers and full liquid-cooling systems are the most common form of GPU cooling we see on the market. The Accelero Hybrid is something different, however. As a liquid cooler, it promises to deliver some powerful performance; but with the addition of a fan on the card shroud, it also promises to deliver good airflow, something most liquid cooling systems don’t bother with. It also looks easy to install due to the closed-loop system, meaning we don’t have to fumble around with fitting the tubes correctly and such. The Accelero Hybrid appears to be extremely GPU friendly, in the sense that it fits a wide variety of graphics card models, including the new NVIDIA GTX 660 Ti. Arctic makes some bold claims, stating that it guarantees “200% cooling performance” that performs “9 times quieter” than stock coolers. It features the F12 (a 120 mm PWM fan), a powerful heat exchanger, and the MX-4 thermal compound to transfer heat efficiently away from the GPU – with 200% cooling performance of the stock cooler. It also comes with an Active Cooling Unit and thermal adhesive specifically designed to enhance the cooling of RAM and VR. Its aerodynamic design further maximizes the airflow efficiency on all surrounding components. The PWM fans are both controlled by the graphics card and work according to the GPU load which minimizes the noise level. The PWM setting can be modified according to the different performance and noise priorities. Click here to see how PWM settings work. Unlike existing VGA LCS, this cooler is compatible to a vast range of NVIDIA and AMD graphics cards. The cooler comes in a standard white box with images of the product and lists of specifications. 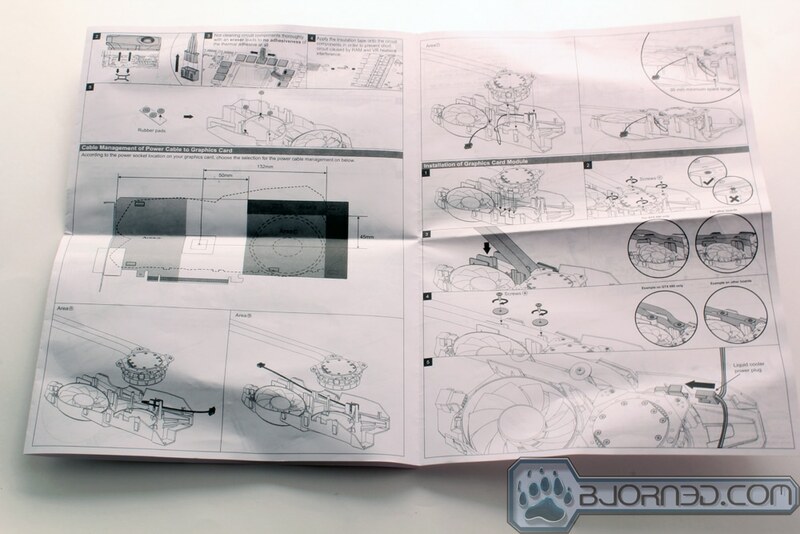 Since the images on the box can be found in the Features section on the previous page, we didn’t feel the need to include an image of the box. However, we can say that the cooler is very securely packaged inside, so there is no chance of it becoming damaged during shipping. Here we see the cooler itself, which comes in 3 parts: the shroud, the closed-loop liquid cooling system (LCS), and the heatsinks. The first picture shows the card shroud and heatsinks. 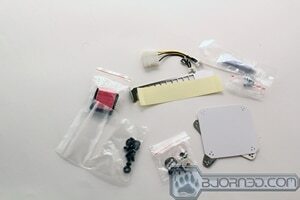 The shroud, which sits on top of the PCB, has a fan that blows air across the heatsinks, which are installed on the card’s VRM and other electronic components. Keep in mind that despite the extensive compatibility tables listed, the cooler only carries instructions for cards with the reference design. 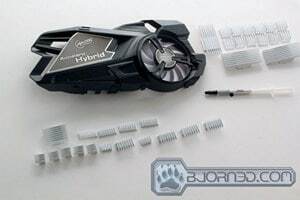 Non-reference cards can still utilize the cooler, but you have to fit the heatsinks to the best of your ability, as we did on our MSI GeForce GTX 660 Ti. However, this should not be a problem, as there are more than enough heatsinks provided, and they come in many different sizes and shapes. We can also see the closed-loop liquid cooling system, which takes the form of a sealed radiator, pump, water block, and tubing. As with any closed-loop system, since the coolant never leaves the loop, no tank is needed. The water block has a pump on top, and a smooth copper-plate base. The copper is not mirror-finish, but it should still do a good job of transferring heat to the liquid. 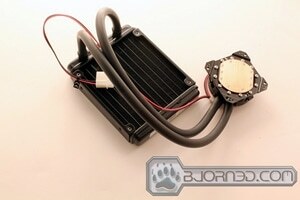 The radiator can be installed in several places in your case, along with the included 120mm fan. When installing the radiator, care should be taken not to twist the cooling tubes out of their sealed position, and to use the proper (included) screws. Using longer screws than specified can cause a puncture in the radiator, and can lead to coolant leakage. These are the materials the Accelero Hybrid comes with. Inside are a series of screws and spacers, a tube of adhesive for the heatsinks, power cables, a backplate, the foam block, the spacing plate, and more. 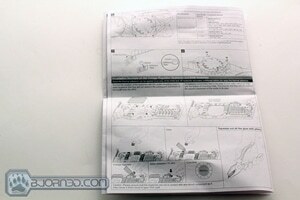 Also included is possibly the most important accessory: the instruction manual. The installation of this cooler is very long and can be complicated, so we highly recommend following the manual for inexperienced customers. 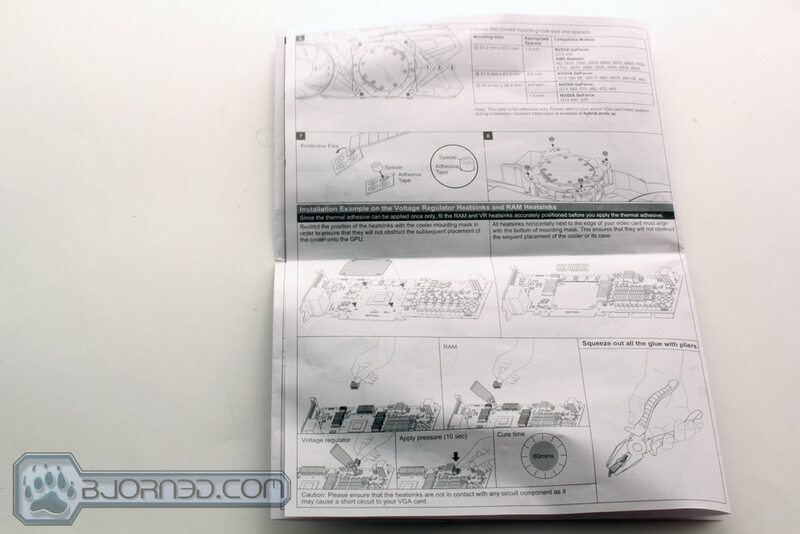 The manual does an amazing job detailing the installation for all types of GPU’s. 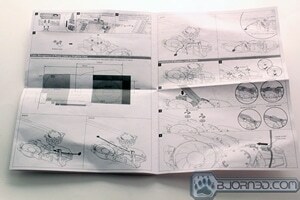 It gives step-by-step instructions with illustrations that we believe users will find helpful. For us, the installation was fairly painless. The only complicated part was figuring out the placement of the component heatsinks, since our card is not of reference design. Be sure to let the heatsinks affix properly to your electronic components–the curing time is about one hour. Unfortunately, the one thing Arctic has not yet done is update the installation guide for compatibility with the GTX 660 Ti. However, the screw-in locations for the water block are the same that are detailed for the GTX 680 and GTX 670. We hope Arctic will update their documentation on this soon, especially since their site boasts the added compatibility. We compared the Arctic Accelero Hybrid with the MSI card’s own Twin Frozr II cooler. The idle temperatures were taken after about 10 minutes of running Windows 7 OS, and the load temperatures after about 10 minutes of Furmark burn-in test. Temperatures were monitored with MSI Afterburner and GPU-Z. 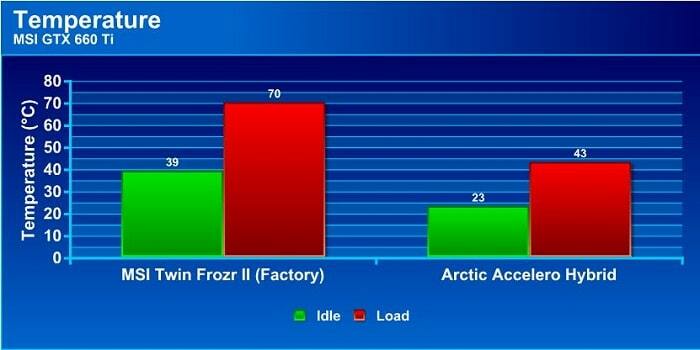 As you can see from the results of our testing, the Arctic Accelero Hybrid really did bring a huge decrease in temperatures to our card. The idle temperature almost halved, and the load temperature also decreased significantly. Keep in mind that this card comes with its own specially designed cooler, so those running a card with a reference cooler will show an even greater decrease in temperatures. Additionally, the cooler is extraordinarily quiet, and we cannot hear it over the rest of our system noise. 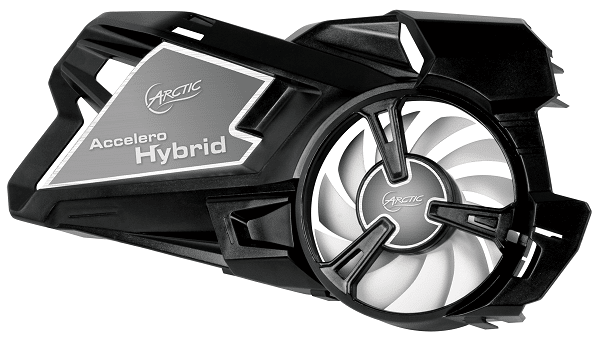 The Arctic Accelero Hybrid brings a tried-and-tested formula to the GPU cooling arena. Previously, GPU coolers had been either totally open-loop liquid-based, or air-based. However, the Accelero Hybrid combines the ease of use of an air cooler with the cooling potential of circulating liquid. The cooler is easy to install provided you follow the instructions, and the most time consuming part is the curing time. It is a highly versatile product, working with multiple cards with both AMD and NVIDIA GPU’s. It is also an excellent product. It allows a huge decrease in the temperature for our GTX 660 Ti, almost halving the idle temperatures. The difference between temperatures was great, and we are very happy with it. The only two negative points we could find is that there is no guideline for non-reference cards. We recognize that it is unfeasible to provide a guideline for every non-reference GPU, but we would have liked to at least see some general tips on heatsink placement. 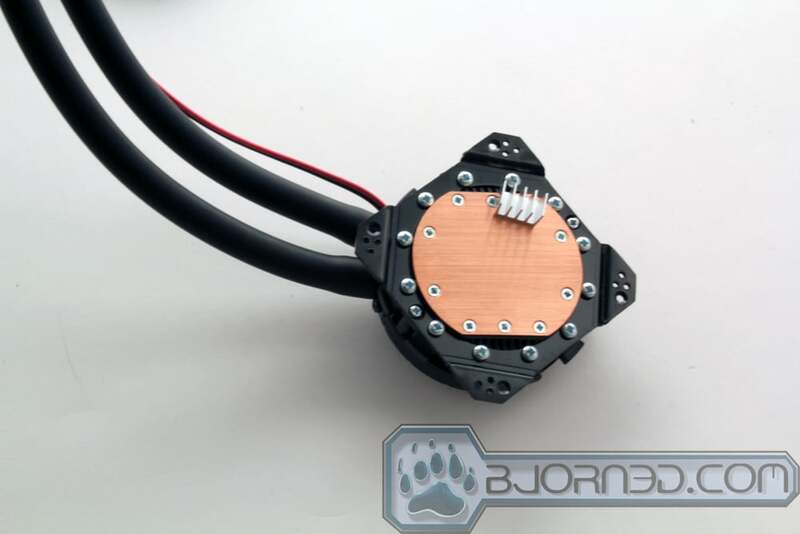 We also hope that Arctic updates their product site soon and includes an installation guideline for the GTX 660 Ti, as this cooler is compatible with the 660 Ti. The Accelero Hybrid comes with a rather steep price tag for a GPU cooler, but we feel that the performance balances it out. We definitely recommend this cooler for anyone who can afford it. Summary: The Arctic Accelero Hybrid brings a new take to the area of GPU cooling. With a closed-loop cooling system, it combines ease of use with excellent performance. For the total absence of hassle during installation and great performance, the Accelero Hybrid earns the Bjorn3D Golden Bear Award. Adi was made aware of this and it has been corrected. Thank you for bringing it to our attention. Good rig, but pricey IMO. Will look for cheaper item instead.